Brahms often created contrasting works in pairs. It was as if he was weighing each new idea that came into his head and sort them into whichever ‘buckets’ fitted best. Think, for example, of his Tragic and Academic Festival overtures. Three such pairs are presented on this disc. Although they belong to the early, middle and late periods of his creative life, they are not radically different in style. In any event, Brahms’ style did not change much over the years. The order of the works provides diversity: the soothing alternates with the angry, Heaven on one hand and the Underworld on the other. The two earliest works may not be as familiar as the rest. This is a shame, for they are very attractive, albeit compositionally less sophisticated. Both could be mistaken for parts from the German Requiem. Ave Maria is luminous and fluffy, like sunlit clouds. It goes from tender pianissimo to powerful avowal. The music resembles softly rocking waves, yet is energetic. The solemn organ-like accompaniment is typical Brahms. The Purcell-style, string-less Begräbnisgesang takes after the All Flesh is Grass movement from the Requiem. The morbid timpani are persistent: reminders of Death. The dark, bass-rich music develops to the heights of avid terror but then there comes a more lyrical, comforting episode, where the timpani are quiet. The residual feeling is unexpectedly positive. Alto Rhapsody is the crown of the orchestral songs. It is part of my personal “shrink-music”: try to listen first to it and then immediately to the first movement of Brahms’ Second Symphony - nothing makes troubles go away faster. The composition is in three sections. The first is like a pregnant introduction, slow and tense. The aria-like second part is passionate, very Romantic, depicting the soul torn by suffering. The chorus joins the soloist in the third part - an emotive prayer, which turns the “poison” back into “balsam”. Gradually comes the feeling of joy, and a confidence that all will be well. In Hölderlin’s Schicksalslied, the narrator laments the fate of the mortals, comparing them to the eternal Gods. The music is twofold. The first face is dreamy and ephemeral: it sings the blessed life of the Gods in the Elysian heights, untroubled, unshaken. The second face is full of dramatic turmoil and distress, as it pictures the life of the mere mortals, down below - “like water flung from cliff to cliff”. There is a Dies irae-like storm, with heavy accents; it reflects the instability of the present and the terror of the future. The ending returns us to the worry-free world of the Immortals. Schiller’s Nänie tells us that beauty must die, and supports this thesis with evidence from Greek mythology: Orpheus and Eurydice, Aphrodite and Adonis, Thetis and Achilles. 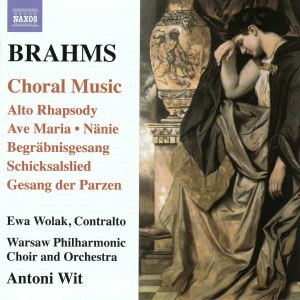 This is another echo of the German Requiem: a most Brahmsian blend of confidence, consolation and commiseration. The writing is robust; the chorus is powerful. This piece is more monolithic than its neighbors, without their spikes and trenches; it rises and recedes like a wave. The Fourth Symphony peeks through the symphonic writing of Gesang der Parzen. The music is stern and potent. Its structure is complex, rondo-like, kind of an inversion to the Schicksalslied: more dramatic parts give way to more lyrical. In the text, extracted from Goethe's Iphigenie auf Tauris, the wise speak of the golden feasts of the Gods, and of the woes of those who have been banished by them. The performances are lean, light and powerful. The general approach is on the slower side, which sometimes makes the music static. The Alto Rhapsody is unhurried, even restrained - one of those readings that conquer you not by concentrated stress, but by beauty. The solo alto singing is almost operatic; Ewa Wolak’s voice is strong and even, without annoying vibrato. It stands well in the big range requirements of the piece. A faster tempo could possibly bring more excitement though the singer admirably copes with the slow tempo. I still feel that the music became less dramatic and less natural as a result. On the other hand, Wolak sings these long notes so beautifully, and makes such lovely transitions between the notes, that I can understand that this was probably a deliberate decision of the conductor, to let us relish her singing. The climax of the third part is loud and very intense, but still beautiful and dignified. Schicksalslied is very persuasive; its tempestuous parts have plenty of drama and impetus, and its ending glows. Nänie is radiant; the beginning is too stately and lacking in motion, but maybe thanks to this starting point the culmination sounds very solemn and mighty. If drive was lacking in the Rhapsody, there is some to spare in Gesang der Parzen. The entire piece just flies forward! The performance is youthful and bouncy while not melting into pudding in more lyrical places. The orchestral interludes have symphonic power. The chorus has a beautiful sound, very good diction, and is well balanced. It is firm and sturdy, yet can be transparent when needed. The orchestra is deft, and blends well with the chorus. The woodwinds are very expressive. The recording is spacious and clear, Naxos-style. The sound is full and majestic especially when loud. Overall this project rejoices in a sense of freshness, like clear water. If you like the feeling of being immersed in a sea of rising and falling waves of a mighty chorus you should try this disc.